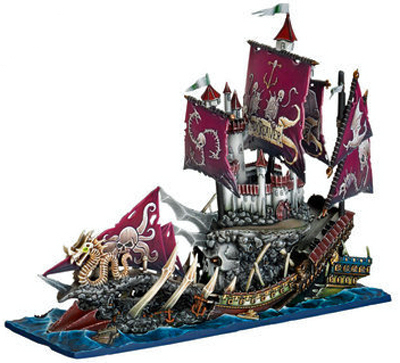 As those of you who have read my reviews of Dreadfleet will know, I wasn’t entirely impressed by the rules. The models are well made, the mat looks great and the rulebook is very pretty, but the game itself? Well, that’s way too random and way too long for my taste. So, I have a very expensive box of nice models sitting about not likely to do anything but gather dust. I could just stick it on Ebay and have done with it, and I was sorely tempted when I played it. Well I never got round to that, and now I’m curious. Instead of just binning it, can I tweak the rules a bit and get a game I like? Don’t change the background – that’s fine already. Keep as many of the original stats and rules as possible. New rules should be kept to a minimum. New rules have to fit with the story and existing rules. Player skill needs to play a bigger role than randomness in deciding the winner. Playing time can be no more than 2 hours maximum for a 10 ship game and 90 minutes would be much better. Having defined some parameters to play within, I came up with some ideas, and when GloatingSwine came over at the weekend we gave it a go. He had loads more thoughts, and between us we bashed together some house rules that form a pretty good starting point. It’s not perfect after one scrap, but it’s proof of concept, and as he put it “there is a game there now”. I’ll tell you more about the house rules and what happened next time, but for now have this one morsel: we played the same 10 ship scenario that took Bob and I 4 hours last time (and that was after we’d played the first scenario and knew the rules a bit). GloatingSwine had never played before and I’d not played since October. We fought the game to a conclusion in 90 minutes. Ooooh interesting. I’ve been plugging away at this myself. So I’ll be interested t see, or should that be sea (yeah I’ll get my coat) where you head with this. Still haven’t nailed the fate cards or how to use them yet, but I have got a working version of the weather up and running now. I thought I had a simple mechanic that would allow for the use of the cards but… it proved too random. lol. It’s actually rather surprising how much effect some small and simple changes have had. It’s not perfect yet by any stretch, but it’s a definite improvement. Looking forward to this Jake, I’ve nearly finished painting all the nice models (and they really are nice), and would love to have a playable game with them. Especially the time reduction as this means it could be an add on game rather than the day’s focus. If you’ve got a 6×4 or bigger table already set up, then with the mat and a few islands you have your “battlefield”, so yes it should be good for add-on games. We only trialed it with a ten ship game too, so one would guess that smaller scenarios would play faster. I’ll be watching the development of this with interest. I have a copy (foolishly allowed myself to be taken in by the “Limited Edition” stuff) but haven’t gotten around to playing it yet. One thought that immediately occurred when looking at the rules, was to get rid of the ‘draw an event card every turn’ rule and have it so that you only draw an event when both players roll the same result for initiative. That should heavily cut down on the elements outside of players control as well as keeping the wind direction much more stable. The other obvious thought was to get rid of all the scenario rules that say roll a d6 for victory points and replace them with a stable value. finnish the project and I might just buy the game. I’ve seen those masts. That’s got to be painful.